How often do you just want to collapse at the end of the day; falling into the sofa like you’ve become an integral part of the fibres? Letting it absorb all the day’s hectic work, demands, challenges and headaches? It’s like a warm embrace from a heating pad. Oh come on! You know that feeling. You heave a huge sigh and every muscle seems to release while you close your eyes in a moment of tech-free silence. Yes, you DID turn off your devices, even for just a few minutes. You’ve stolen a few minutes of luxurious bliss. You’re content and relaxed. UNTIL… suddenly, your mind hops back into overdrive; reviewing your day, your ‘To Do’ lists and what needs to be done ON and IN the business. Does it ever end you ask? Is there a break from the rat race? A few minutes? A few hours? …Anything?? Try this, visualise yourself on an island retreat in the Caribbean where gentle breezes sway your hammock under a palm tree and your chilled glass leaves condensation on your fingers. You take a sip as your tongue savours the tantalising fresh island coconut, pineapple and rum combination while the tin sounds of the steel band lulls you into a sense of comfort and relaxation. Then, reality slaps you on the forehead and you open your weary eyes to sadly see the evidence all around you of mounds of work needing attention. Ack. Get a grip and take a look at your options. Lastly, you build a solid strategy leveraging your time and focus your core skills so you aren’t burnt out and dragging at days end. YAHOO = You Also Have Other Options. We venture to guess that number three is the most inviting? We hope so. Delegating has long been a success tool for growing your business. There are hundreds of articles focused on the positive power of outsourcing. The goal is moving the low-payoff activities from YOUR desk so you can focus on your core genius, the things only you can do. Forming a team is a growth mentality. It can take an army to build a business. A team to orchestrate your success and manage each facet of your internal systems and processes. You can’t wear every single hat in your business and expect to experience forward movement. You can get stuck, stagnate or otherwise hit a plateau and that isn’t why you founded your business. Failing to off-load those low-payoff tasks also caps your income opportunity. As others point out, delegating isn’t a fad or a quick fix but a time tested method to help you scale your business beyond yourself. Think about your business and your goals. What should you be outsourcing? “In order to grow a successful business, it’s important to let go of some perfectionism and delegate certain tasks so you can focus on your strengths.” Diana Adams. “You cannot grow your business all on your own so stop trying to. It’s time for you to trust others to help you. Without delegation your business will be limited by your own time and energy.” Matthew Swyers. “My advice for entrepreneurs who wish to expand their business? Simply let go. Take on only the responsibilities you and only you can do. And as for the rest, delegate.” Jane Wurwand. “If you want to grow your business past a certain level, you’ve got to add more people. You’ve got 24 hours in the day, and you’re never going to get more. So if you need to take care of more stuff… because that’s what you need to do to grow a business – do more stuff – you’ve got to add other people’s 24 hours. You’ve GOT to delegate.” Laura Roeder. “Most entrepreneurs have great talents but many times they think they can do it all. That can really stall the growth of the business. By outsourcing the day-to-day back-office tasks, the business owner has more time to focus on generating income.” Laura Lee Sparks. “Outsourcing has made a powerful impact on their growth, productivity and bottom line. Small business, augmented by a global pool of human capital, can compete directly with the biggest players in their space, and win.” David Walsh. “At first I felt like I was the only person who could do the work efficiently; I wanted control over everything. But I wanted my business to grow and in order to do that I had to let go and start delegating.” Tonya Thomas. “When you outsource, you can focus your time, attention and resources on your company’s core competencies–and spend your time setting new goals and finding ways to achieve them.” Nancy Mann Jackson. WOW. Those are some pretty impressive quotes, don’t you think? You may know some of these of these business owners or maybe you don’t, but no matter what, they are leveraging their skills, time and expertise with the help of others. They are creating virtual teams to outsource various aspects of their daily business competencies in order to grow. We did it and we have never looked back. 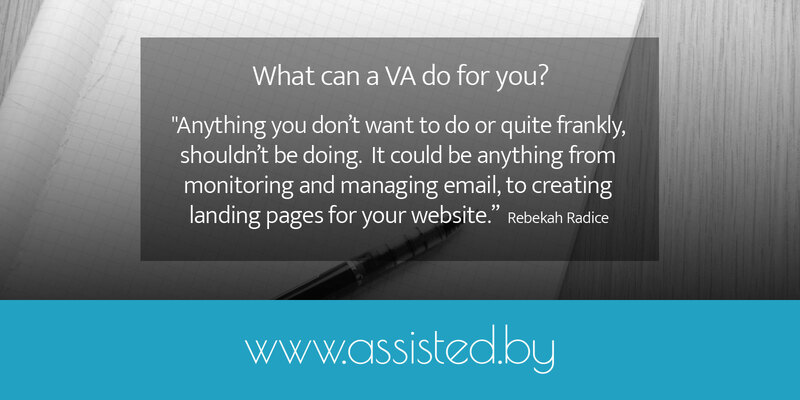 Yes, as virtual assistants; we also delegate to virtual assistants. If you have ever thought about delegating or have a few questions, let’s talk about your options because you don’t have to build your company alone.